Hoping to erase steak-sauce stains from a seersucker suit, we headed over to Alumni Gymnasium, where we’d heard there was bleach work going on. Turns out that we heard wrong (again!). It was bleacher work — the removal, in fact, of the hard-pine bleachers that have put generations of Bobcat boosters’ bottoms good and close to the basketball and volleyball action. So close, in fact, that the gym has gained a certain reputation as an intimidating venue for Bobcat opponents. 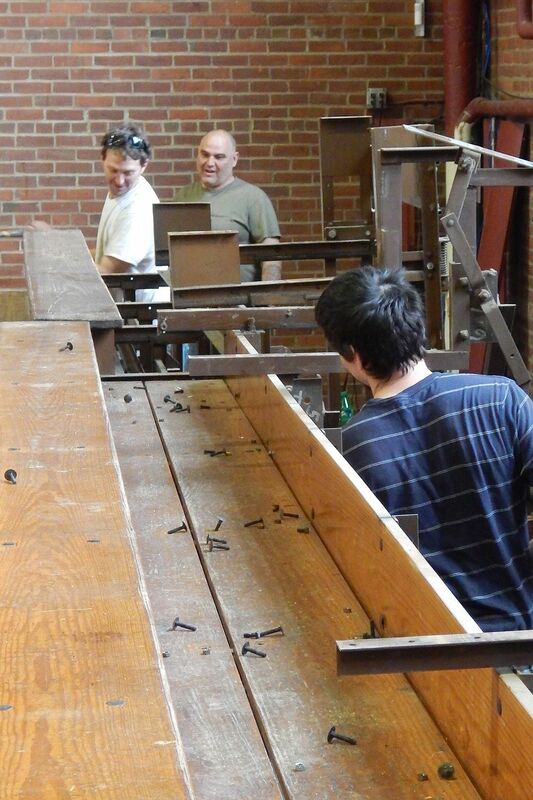 We stopped in on Monday, April 2, as Jim Libbey and his two-man crew were just finding their rhythm in the repetitious work of unbolting the bleachers’ planks, metal supporting frames, and other hardware, and toting it all out back. And the shiny maple floor will be next to go, scheduled for removal starting April 18. We wondered about the age of the bleachers. Libbey’s team didn’t have a figure at hand, but Ben Bedell did point out that they were encountering many square nuts, which were commonly used until the mid-20th century. They were supplanted by the hexagonal nuts prevalent now, which enable more frequent and therefore easier turns with the wrench. Be that as it may, nostalgia didn’t slow anyone down and the bleachers were gone before the end of the week. 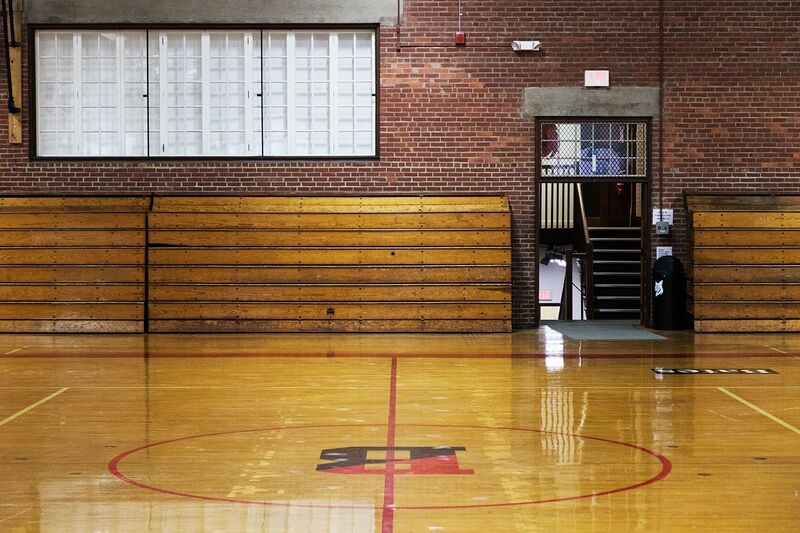 With replacement bleachers and floor expected to be in place by mid-June, it’s all part of a renovation project that will leave the 92-year-old gym ready for plenty more Bobcat excitement. The condition of the floor was the prime mover for the project, says project manager Shelby Burgau, who joined Facility Services’ Capital Planning and Construction group last September. Over the course of periodic refinishing jobs, the maple had been sanded down nearly to the point of exposing the tongue-and-groove joints holding the planks together. “We really couldn’t get away with sanding it down again,” Burgau says. 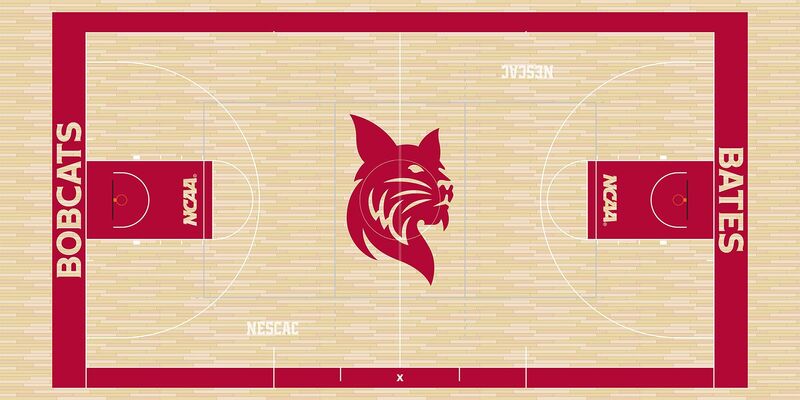 Replacing the floor, adds Director of Athletics Jason Fein, gives Bates not only a brand-new, state-of-the-art playing surface, but a showcase for current branding. Notably, the urbane Bobcat mascot image introduced in 2013 will take pride of place at center court, now occupied by the so-called split B. Logos for the NCAA and NESCAC will be also be added to the layout. “It will look a lot better at the end of the day,” Burgau says. 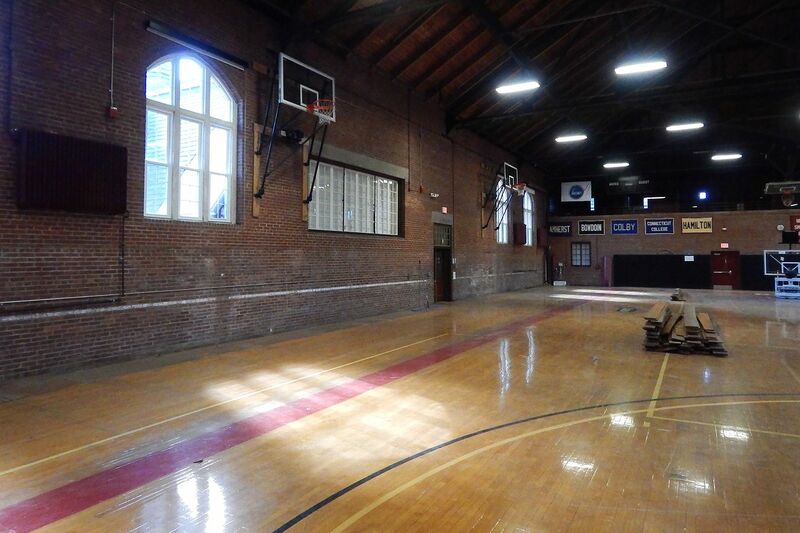 The new floor will again be maple, and New England Sports Floors of Lowell, Mass., is the subcontractor. Of course, before anything could be done with the floor, the bleachers had to go away. Like the old set, the new ones will be retractable to embiggen the floor space between games — but henceforth motors will do that work, instead of muscles. 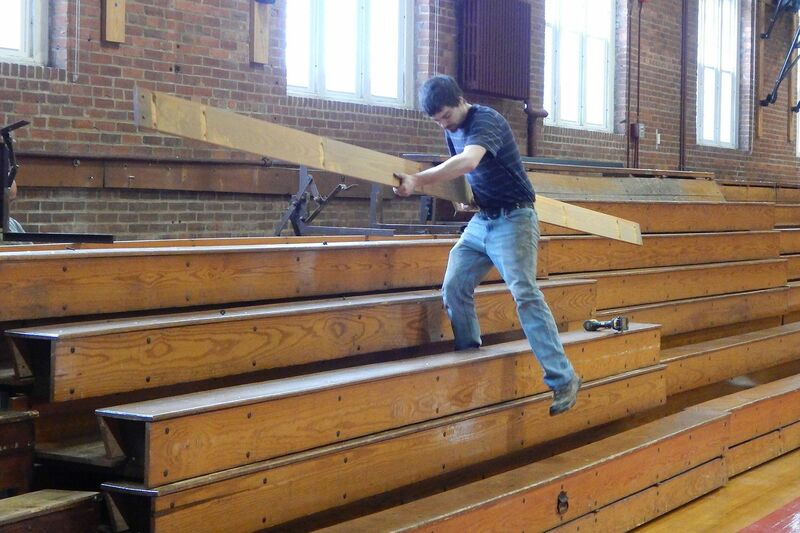 “The current bleachers are not only old, but it’s pretty labor-intensive to pull them in and out,” Burgau says. Hussey Seating Company of North Berwick, Maine, is fabricating the bleachers, and Robert H. Lord Co. of Manchester, Conn., is the subcontractor supervising the installation to be executed by J.M. Libbey and Sons. Taking advantage of all the newly unobstructed space, a spate of mechanical and electrical work is being sandwiched between bleacher demolition last week and floor removal next week. Damon Mechanical Services of Auburn, a familiar name in these updates, is relocating heating-system pipes along the walls where the bleachers used to be. According to the schedule, the floor work should take about a month, wrapping up the week of May 14, says Burgau. “After the floor is complete, we’ll take a little pause for graduation, in case the gym needs to be used as a rain backup” — in which case it serves as a robing and assembly area for the faculty and graduates, with the actual ceremony across the street in Merrill Gym. And then, hard on the heels of Commencement, bleacher installation should begin the week of May 29. Burgau adds that, to expand the gym’s capacity, the Alumni Gym stage will sport permanent bleachers for the first time. Those too will feature power retraction. “Then we have just the final wrap-up, installing equipment like the scorer’s table,” she says. “Come June 18, the gym will be turned back over to the coaches” for summer camps, and to the Bates Dance Festival for rehearsals. Can we talk? Campus Construction Update welcomes your questions and comments about current, past, and future construction at Bates. Write to dhubley@bates.edu, putting “Campus Construction” or “Is anyone still wearing seersucker?” in the subject line.